The American Nicholas Odgen Rood (1831-1902), who had studied physics, started to paint during a visit to Germany. His interest in colours thus encompassed the scientific and artistic points of view, and both these aspects underlay his attempts to impose a systematic order on colours. His book Modern Chromatics appeared in 1879, its subtitle promising «Applications for Art and Industry». Rood announces: «an introduction to the facts, in a simple and comprehensive way, which form the basis of the artist’s use of colours». A second edition of the work appeared two years later, this time with the less interesting title Student’s Textbook of Colour, in which he instructs artists on the insights of Helmholtz, and encourages them to «paint with light». Rood’s colour system proposes concentric colour-circles for the first time, based on the primary colours red, green and blue, and possessing a total of 12 outer segments of equal size (not shown here). The colours of these segments are red, orange, orange-yellow, yellow, green-yellow, green, green-blue, cyan, blue, ultramarine-blue, violet and purple. The circles become paler as they progress inwards, with the centre of the rings finally containing white. In addition to his rather conventional colour-circle, Rood produced the scientific version which we show to the left. The colours, with their precise angular positions, are those actually used by painters on their palettes. The basis of Rood’s colour-wheel is a laborious improvement on the Maxwell triangle. As a physicist, Rood was interested in the additive mixture of colours, and he used the spinning colour-tops devised by James C. Maxwell to help determine the exact position of individual colours and their predominance. His colour mixtures are attained by spinning colour-tops carrying the primary colours at varying proportions (of surface area), with the resulting impression then being compared with an optical grey composed of black and white components. By varying the proportions of each primary colour on the spinning tops, it is possible to establish the relative proportions required to produce a colourless grey. These resultant proportions are then treated in the Newtonian sense: as a mass attached to the end of a lever, in other words, with the length of the lever being adjusted so that the system remains in equilibrium. 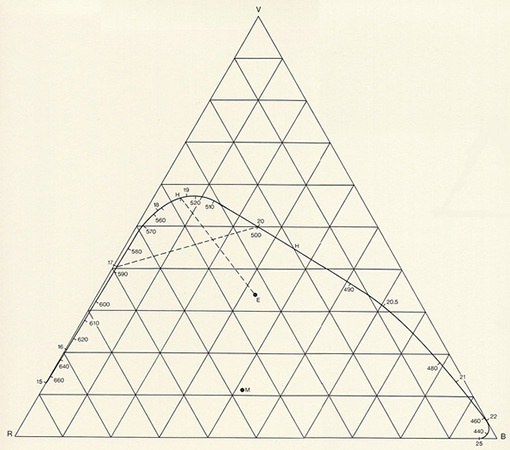 After a series of wearisome measurements — not to mention some wretched formulae — Rood was able to produce a triangle (not shown here) which showed «the colours and the colour-hues according to their angular position and their saturation or intensity through greater or lesser distancing from white», as stated in Modern Chromatics. Green (verde), emerald green (verde smeraldo), very green blue (blu molto verdastro), greenish blue (blu verdastro), greenish cyan (blu cyan verdastro), cyan 2 and 1 (cyan), blue (blu), natural ultramarine blue (blu oltremare naturale), artificial ultramarine blue (blu oltremare artificiale), violet (violetto), purple (porpora), purple red (porpora rosso), carmine red (carminio), spectral red (rosso spettrale), vermillion (vermiglione), orange red (minio), orange (arancio), yellow orange (giallo arancio) yellow (giallo) greenish yellow (giallo verdastro), green-yellow (verde giallo) and back to green (verde). In dealing with colours, Rood’s mathematical diagram promised the precision which Georges Seurat and Neoimpressionism strove for after 1880. No wonder, therefore, that they felt attracted to Modern Chromatics. It is known, for example, that Seurat possessed Rood’s asymmetrical colour-wheel and had oriented himself towards it. Nevertheless, Rood had himself emphasised that the question of an appropriate combination of colours (harmony) cannot be answered «using the methods of the laboratory», and that «dark, and even obscure considerations» were involved. 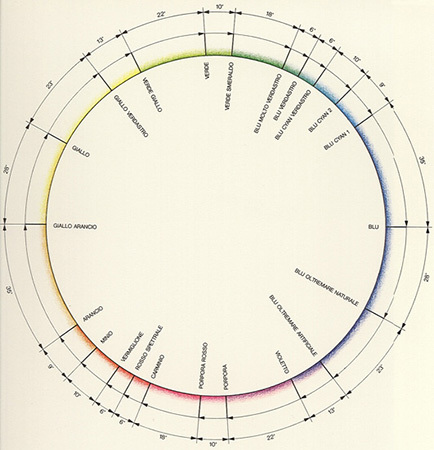 If Rood’s circle is stretched and shown as a column, a kind of psychological spectrum will result which, when compared with the physical (prismatic) spectrum (left-hand column), will show the varying predominance of colours. (Here, the horizontal lines signify the wavelengths of the specified colours.) Red, which so impresses itself on our minds and therefore takes up so much space in the right-hand column, remains prettily placed at the edge as a physical phenomenon. What may for us be a priority, is not necessarily so important in the factual world. Date: In 1879, the American physicist Nicolas Odgen Rood published his research and findings on physiological optics. 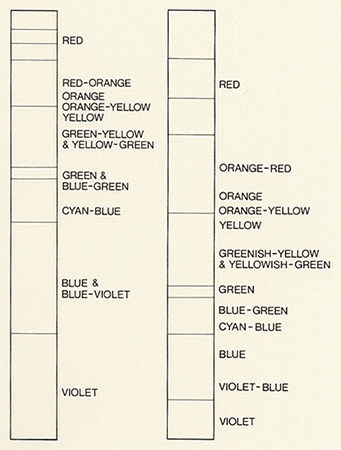 Bibliography: N. O. Rood, «Modern Chromatics with Application to Art and Industry», Chicago 1879; F. Birren, «Principles of Color», New York 1969; A. Hope und M. Walsh, «The Color Compendium», New York 1990.